New properties are available in Macro Language to allow changing table cell background colors and paragraph spacing. 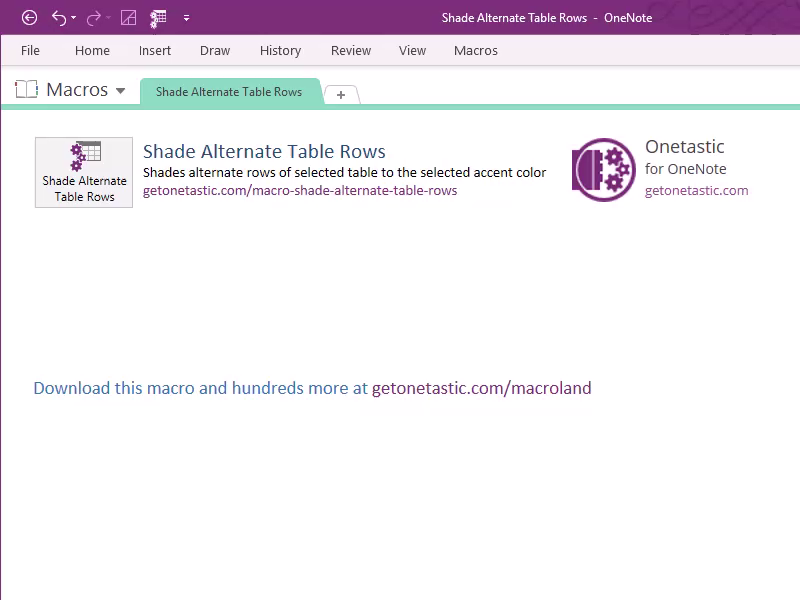 These properties are only available on OneNote 2013, therefore macros that use them cannot be installed on OneNote 2010. A sample macro that changes the shading of alternate rows of the selected table is available in Macroland: Shade Alternate Table Rows. You can see it in action below. Paragraph spacing properties were originally read-only. They are now made read-write. Paragraph spacing options are also added to Custom Styles again for OneNote 2013 and above versions. This update additionally includes a number of bug fixes. You're AWESOME, Thank you so much for finally getting to the spacing feature, It's so beautiful now, It got me almost jumping when I saw that now it's finally supported! is there a macro that sets the new pages to be automatically added at the top without me having to constantly resort or click "add to top"? Is there a macro that can create a note book based on the core structure of an existing notebook. For example keeping all the sections and section groups but not carrying over any pages or data?